Go Picnic is a line of ready-to-eat boxed meals that are not only shelf-stable but also nutritious, featuring high-quality ingredients. Initially created to meet the challenges of feeding airline travelers, Go Picnic has evolved beyond mere grab and go convenience to include many offerings suitable for even strict dietary requirements such as Kosher meals, Gluten-Free meals, Vegetarian meals, and Halal meals as well as dairy, soy and nut allergies. I received a sampling of Go Picnic meals and was impressed with the diversity of foods represented: everything from Nutella to hummus to tuna fish! 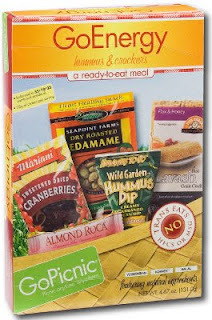 Go Picnic's forte is obviously to throw into your bag on the way out the door, but I found their meals are also a great way to sample brands that I might not necessarily want to buy a whole box full of at the health food store like Enjoy Life cookies or Late July crackers. The packaging seemed a bit excessive to me intially (every component of a meal is individually-wrapped within the main meal box) but much of it is recyclable and I have to admit that the small package concept was very successful with my kids. For example, I never would have suspected that Jasper would like salami, since he really isn't into meat! I have no idea why pre-packaged food is so much more appealing to children, but at least Go Picnic is committed to using as few preservatives as possible so you can be sure there aren't extraneous fillers. Overall, I think Go Picnic is a great solution when you know you will be unable to find healthy food on the go and can't take a cooler with you. We got to try these a while back and I thought they were fabulous! Every single thing was delicious...I'm seriously thinking about ordering a whole bunch just to have on hand!